I’m trying to learn the drum beat from Paul Simon’s “Fifty Ways to Leave Your Lover.” That distinctive Steve Gadd beat that starts the song. The beat that seems to have 3 to 4 different beats in it, but when you put it all together it sounds like one. I’m not really interested in the whole song just that first few bars with that distinctive beat. I listen to it, and then I start the track again, listen, start over, listen, and start over. I don’t get it and I’ve been trying to learn it for over a year. I once asked Jon, one of my first drum teachers, to play it for me and effortlessly he reproduced the beat for me. “Where did you learn it?” I asked him, in awe. I didn’t. And so, by implication, I felt that I wasn’t a drummer. Not too far off the mark really since I was still in the first year of learning. That beat has become my new Everest – a mountain I have chosen to climb. And I’m not doing shortcuts. I’m not looking up Steve Gadd on YouTube. Or looking for sheet music. No, I’m just listening to the song, over and over again. But even as I repeat the track over and over and try to imagine Steve Gadd playing that distinctive beat that chik-chik-chikitty-chikitty-chik-boom inside my head I see not drums and cymbals, but the blue and white landscape of a Grecian island. I see and smell the sea. I taste the tang of yogurt and the sweetness of honey. And then I remember. Greece. The first time I ever really listened to Paul Simon I was on Crete on holiday from school in England. The trip to Crete was a last minute thought right before term ended in March. We had a month off. The other Americans were going to Morocco to get high and sing endless rounds of “Marrakesh Express” in second class train cars. I wanted to go elsewhere and I wanted to be warm. The cloudy damp of Northern England had depressed me and given me my first taste of seasonal depression. Everywhere I went the air was heavy with cold and damp. So I was a ripe target for the advertising of a Thomas Cook Travel Agency. I was hunched under an umbrella walking down the High Street when I saw a poster of a beach and an island. On impulse I walked in and asked for a brochure. In my room, I looked at a map of Europe and found the southernmost point – Greece – and then, the southernmost island – Crete. 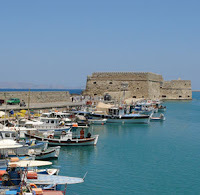 In less than a month, I landed in Heraklion, sleepy and dazed from the early flight from Gatwick and the traveling I had done to Wales the week before. I wanted to lie down, but there was still a two hour bus ride to get to the town where I had rented a flat for two weeks. From inside the bus, I watched the rocky, dry terrain pass and the goats that stepped lightly over the arid rock. I was traveling light and in those days one couldn’t bring 200 songs with them on an mp3 player. On those days, we had a tape cassette player and we had to choose the tapes we would bring. How many tapes could I pack before it took up too much space in my small backpack? For me, I think, it must have been three or four. I can’t remember two, but I do remember the other two: Paul Simon’s Greatest Hits and The Eagles. I spent years after denying those two choices, but at that moment in Greece they were inspired. It may only be in other countries that we begin to appreciate how American we really are, and it was only through these two tapes that I understood I was, for better or worse, an American. It was on a beach on Crete, as I watched a boat float into the harbor, its white sail a stark contrast to the brilliant blue of the Mediterranean, that I could picture the New York street where he meets the old lover and the playground where Julio plays or the evening in its lateness. Even the much-maligned Eagles seemed special on that island. Laying on small beaches I pictured driving endless highways, blacktop striped with yellow that extended into orange horizons. Years later, I’m sitting with Paul Simon again, but instead of picturing the flatness of an American prairie or the skyscrapers of New York, I’m picturing an island ripe with oranges. Memory is an odd thing. I think that’s why music is so fascinating. A song is so flexible – it means for us not just what the lyrics say – but the feelings that memory imprints upon the song. “Fifty Ways to Leave Your Lover” isn’t just about relationship’s end, but, for me, it’s about a time when I was young and traveling looking for the very things that Paul Simon is singing about – the friends, the lovers, the bars, the cities, the memories. And underneath it all – that beat – that chik-chik-chikity-chik-boom. God, how does he play it? Hey — I’m learning things about you. Ain’t blogs great? You dredge up the past and suddenly understand what it means — or at least find another perspective. Something about the process of writing heps sort things out. It’s a great tool of discovery! I used to be really frustrated by the writing dictum: write everyday. I used to think “write about what?” But now that we have the band — a story to tell appears everyday. The irony though is that I started the blog to write about what happens today but I discover that what happens today has everything to do with what happened years ago. Amazing. So memories come back. Things I haven’t thought of in years. And…I’ve been reading Graham Greene — the memory master.